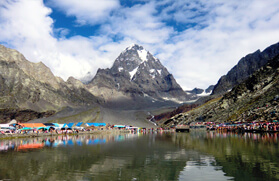 Approximately 6 kilomers from Manali towards Naggar, lies the quaint village of Jagatsukh, which is popular for hosting some of the ancient temples dedicated to Lord Shiva and Sandhya Gayatri in Shikhara Style. 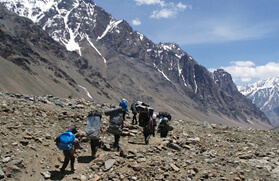 Further, the village often sparks as a base for several trekkers journeying to the base camp of Deo Tibba. The trek to the base of Deo Tibba from Jagatsukh is often picked by the amateur walkers seeking to capture the opulent beauty of the Himalayan horizon for once in a lifetime experience. The journey divulges a varied landscape that is patched with orchards within the thick forest dotted with varied species of Himalayan trees and plants. 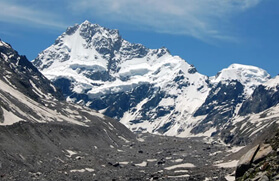 Further, it enriches with the magnificent view of the Deo Tibba Peak that towers at an elevation of 6,001 meters. The trail follows parallel to the Pir Panjal Range and goes along the Bahangan Nullah from Khanul, which is tucked at 2,020 meters. One of the easiest treks in Himachal Pradesh and a short trek from Manali, the trek to the base of Deo Tibba woos the souls of several trekkers every year. The trail from Jagatsukh to the base of Deo Tibba at 4,020 meters heads to Khanul and it passes through a dense forest that is rich with wild flowering plants and varied species of alpine trees. From Khanul the route winds to Chhika at 2,960 meters wherefrom you can experience the stunning waterfall. 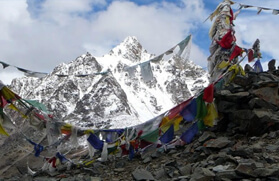 Thereafter, the route leads to a gradual incline to Seri, which is at an elevation of 3,390 meters and one can catch a glimpse of the Deo Tibba peak on this trail. 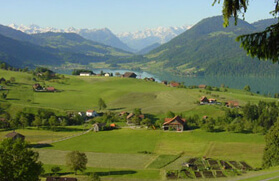 Seri was once a glaciated lake, but is now a meadow carpeted with an astounding variety of herbs and alpine flowers. 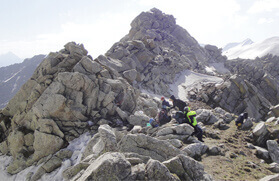 From Seri the trail snakes through the alpine plateau of Taina at an elevation above 4,000 meters and the vicinity is embroidered with varied species of flowering plants and small lakes. From Taina the trail follows a downhill track to Bhanara village before finally arriving at Manali. The best time to set about on this trail from Jagatsukh to the base of Deo Tibba is in the months of May, June and July and from September to October. 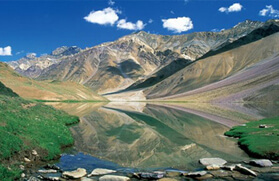 The trek is approximately of 4 -5 days from Manali and is an appropriate trek for beginners and family holidayers. Six km motorable road leads to the village of Jagatsukh after which the trail winds upwards alongside the Bahangan Nullah from Khanul which is the first days camp. The Manali valley appears far below and to the east lies the mighty mountain - Deo Tibba. Along, the way to Khanul green forests with an amazing variety of vegetation dot the way. The six kilometer long trail goes along an alpine plateau and is almost a gradual incline. All around the trail lie excellent rock climbing hills. Camp at Chhika. Today the trail continues uphill for 5 km and the sudden appearance of Deo Tibba is breathtaking. Seri was once a glaciated lake, but is now a meadow carpeted with an astounding variety of herbs and alpine flowers. Camp in this fairyland beneath a clear blue sky twinkling with a million stars. You have two options, both worth the short climbs, involved. 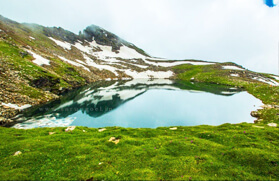 The flora enthusiast will have a wonderful time trying to identify the hundreds of flowers growing everywhere, and the tiny lake provides some excellent views of Deo Tibba and others peaks of Manali and Spiti ranges. Leaving this wonderland behind, the trail descends downwards back to the forests that lie above Manali. Camp is at the village of Bahnara. There is an ancient temple at Bahnara, while Arjun Gufa is the place where Arjuna did penance.drive to Manali.